The entire history of your business is chronicled by the email messages that are contained in Microsoft Outlook. Important threads that detail the birth, evolution, and resolution of projects, ideas, and relationships complete with contact information have all been encapsulated in your inbox. With so much riding on these messages, it's important not only to maintain backups of Outlook at all times but also to consider saving those email messages to different formats in order to facilitate preservation. 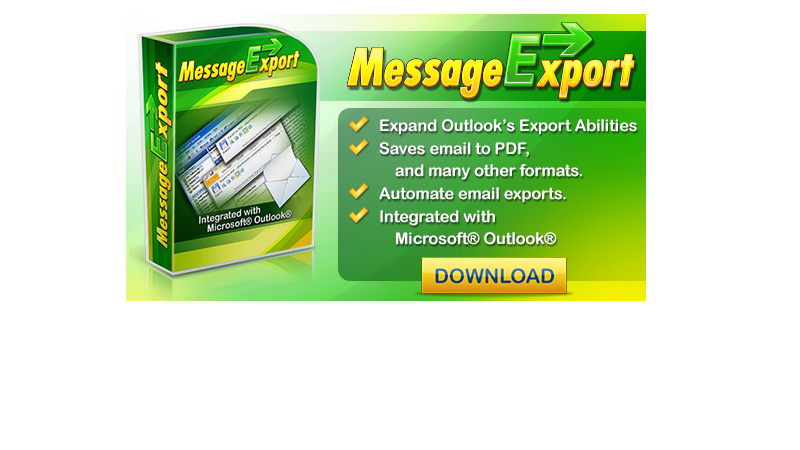 Support Windows versions of Microsoft Office Outlook for MessageExport are 2016/2013/2010, and the upcoming 2019. 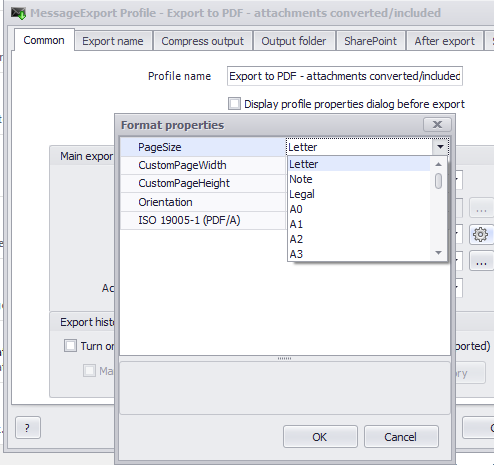 It not only allows you to export your Outlook messages in one of nine different file formats, it also lets you create advanced profiles that enable you to compress exported emails to a password-protected archive which is then automatically placed in a directory location of your choice. In other words, MessageExport not only slices, it dices too! First things first, the formats. 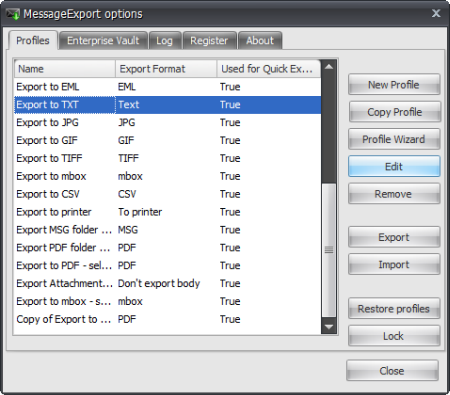 Using MessageExport, you can extract Outlook messages as PDF, MBOX, MSG, EML, HTML, MHT, TXT, GIF, JPG, and TIFF formatted files. Think about it - this means that you can create a database of emails stored as images, or make them universally accessible by Adobe Reader, or post them to the internet on your website as HTML. 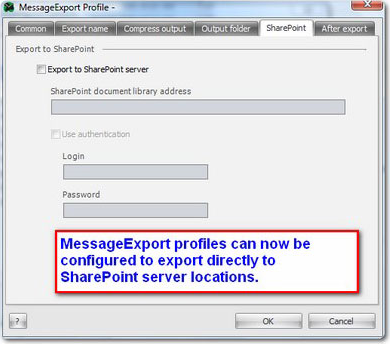 You can even create files that are compatible with other Microsoft applications using the Microsoft Messaging API and save directly to Microsoft Sharepoint servers! 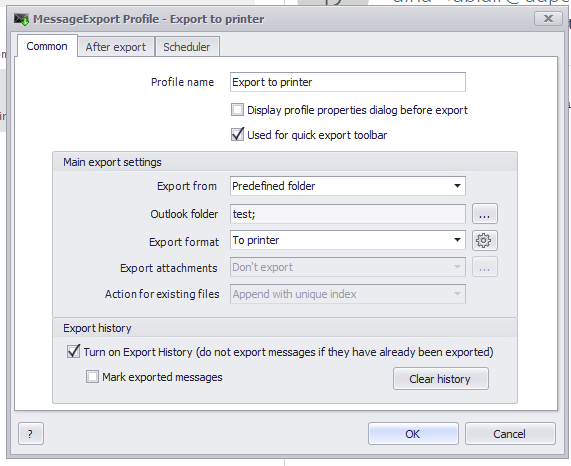 When it comes to efficient workflows, MessageExport covers all of the bases. You will always have the ability to have your extracts compressed and encrypted to a password-protected ZIP archive. You can also perform more advanced macro functions such as extracting file attachments, removing the source messages, and invoking shell commands after the export. All of these steps are saved as a unique profile, and you can create as many profiles as you need. Save extracts to Microsoft Sharepoint servers. Use extracts in other Microsoft applications using MAPI. Export to MBOX format. Import your email into Thunderbird or any email client that supports mbox. 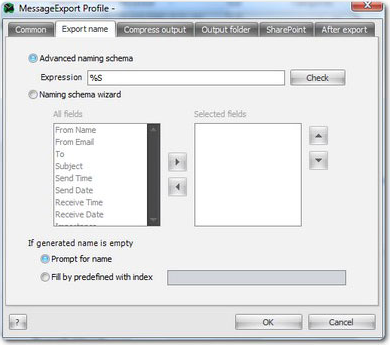 Export an Outlook folder structure and preserve that structure during the export operation. Utilize drag and drop functionality. 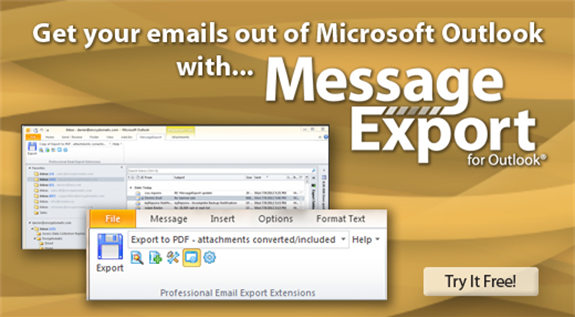 After you purchase MessageExport add-in for Outlook it may be used indefinitely. 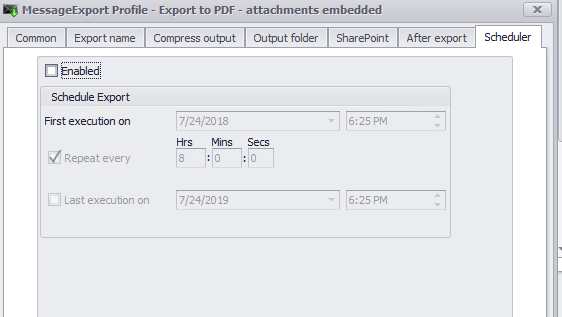 MessageExport add-in for Outlook is licensed per user, so if more people are going to use MessageExport add-in for Outlook you will need to purchase additional copies. We're glad to be back on BDJ. Thanks for checking us out. Encryptomatic LLC is small software company based in Minnesota. Since 2005, we've worked hard to build products that help our customers manage their email and communicate securely. MessageExport is a product that was customer driven right from the start. 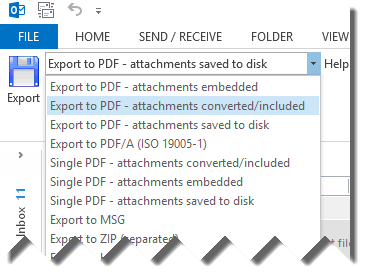 One day I answered a phone call from an architect who needed a simple way to automatically convert Outlook emails to PDF and then copy that file to a shared drive. We built this product from that interaction, and since then it has expanded in capability and taken off. We don't do promo's like this very often, but when we do it's on BDJ. Though today's offer price is far below our standard price, and though you're not our regular target market, we come to BDJ because of the valuable feedback we recieve from lots people in a short period of time. This feedback helps fill our kanban stack and drives our developers to innovate. Thanks again, and if you have any questions just ask! Peter User "You must install/register the software within 15 days, and cannot do so afterwards." Antonio Maradiaga Hello @Peter User, The statement is part of BitsDuJour policy to make sure that you got a working key. You can install the software and use the activation key after the 15 days. You can also release the license key up to 5 times and transfer it to another machine. Linda Bloom I notice it doesn't mention Outlook 365; does it work with that? You can probably achieve the same results going through several steps for each individual email, but for me that process would cost way more in my time than the full price I paid for the product. At $20 it is a true bargain. Antonio Maradiaga Hello @Gary User, thank you for sharing your experience with everyone. Have a great day! Carlo Caputo HI, does this add-in work with both 32- and 64-bit Office/Outlook? Just look for the attachment icon on your viewer. Thank you for sharing your feedback. I use PDF-XChange Editor and found the attachment icon. Carlo Caputo Great product, just tried it. Would be nice if one could hide header-fields like "Category" from being printed in the PDF. Antonio Maradiaga Hello @Carlo Caputo, there is one feature for each profile to include the mail headers, this applies to all fields on the headers https://www.screencast.com/t/jM9vXq0cdT give that a try. Unfortunately, there are no individual fields options for the headers. Carlo Caputo @Antonio Maradiaga: Thank you, already found it.One can't have everything, I guess. Peter User I have made a new profile and I want to duplicate it, is this possible? Can I export my profiles or make a backup? E. Douglas Jensen My thanks to Antonio for calling me to address my questions. Antonio Maradiaga Hello @John Hood, Our apologies for the inconvenient. We will check the error logs and have our team respond to you as soon as possible. John Hood Your response that you do not cover Outlook 7 but do cover cover Win 7 is an oxymoron. I have all the essential ingredients i.e. memory, space, etc. It is sad that you do not support Outlook 7. Not going to be forced to go buy Outlook 10. There are a lot of people still hanging on and using 7 version stuff including Outlook 7 . Memory is not corrupt. Nico Westerdale owner of BitsduJour - I want my purchase money returned to Paypal please. Constantin Florea @John Hood, I just sent you an email regarding your request. John Hood Constantin Florea - thank you - got it - and the refund made it to Paypal. Good service. Happy Holidays.